One of the joys of having a garden, is the amount of wildlife it draws. Birds, lizards, insects, hedgehogs, butterflies, bees, the list is endless. 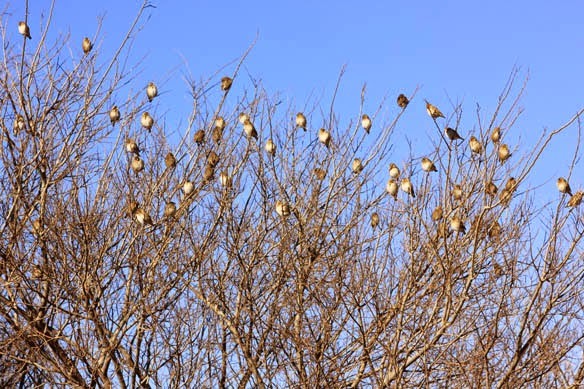 In winter the wild birds can have a hard time finding enough food. As winter approaches, many birds change some of their eating habits. Birds that usually eat insects may start to eat berries or fruit to supplement their diets. 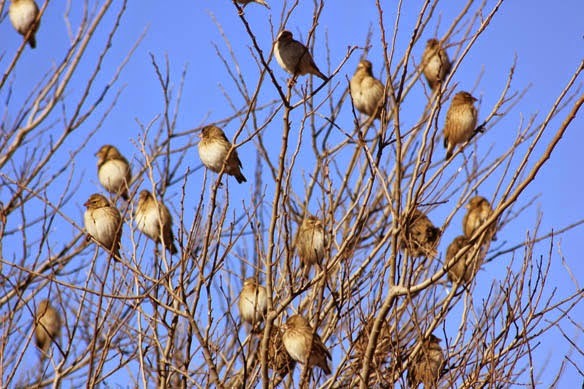 Birds will start to look for reliable sources of food for wintertime survival. Turn your garden into a haven which they will frequently visit for something to eat and drink. 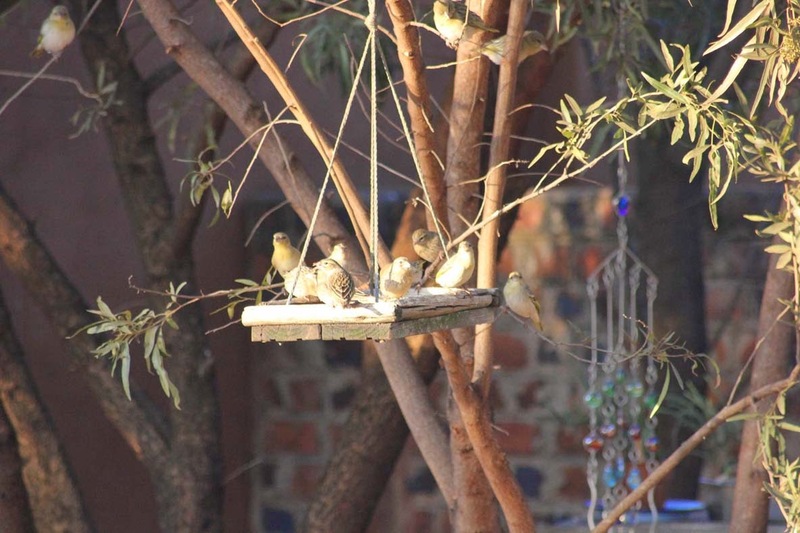 Feeding the birds is a rewarding and enjoyable hobby in the midst of chilly winter weather. 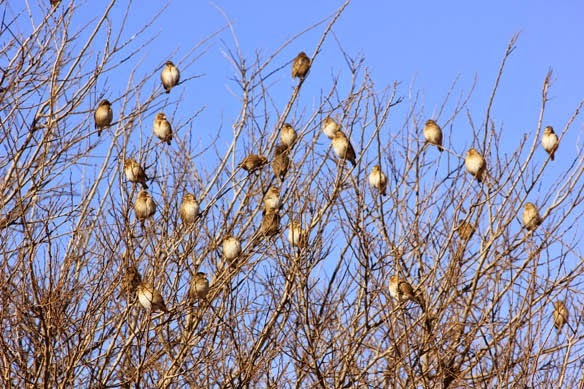 To attract the greatest number of species in the winter, it is important to have a number of different birdfeeders available, Ideally, winter birdfeeders should be placed in sheltered locations out of the most severe winds. Placing feeders closer to the house will be effective and will help keep the birds visible for indoor bird watching. 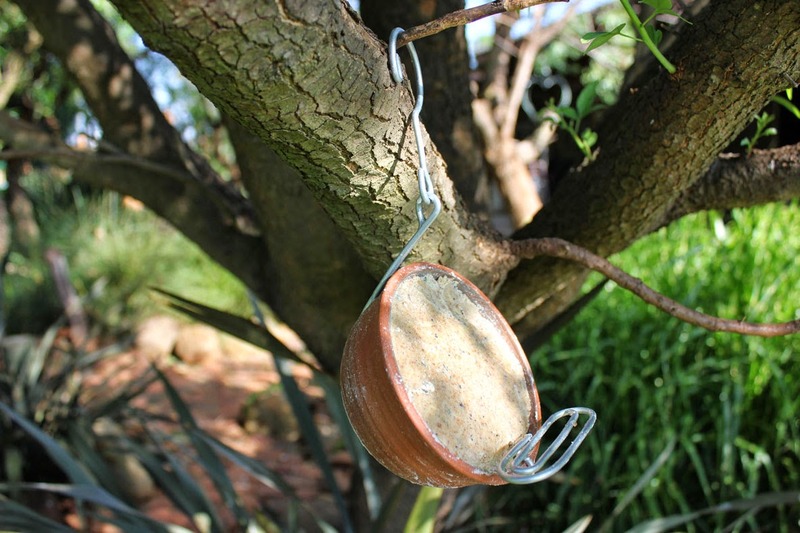 At the same time, feeders should be placed near protective cover such as hedges or trees to offer birds safety from predators. In winter, I put out food and water on a regular basis. In severe weather, I feed twice daily: in the morning and in the early afternoon. During summer I cut down to once daily, in the morning, with a good mix of Black sunflower seeds, pinhead oatmeal, soaked sultanas, raisins and currants, mild grated cheese, mealworms, mixes for insectivorous birds and good seed mixtures. Soft apples and pears cut in half, bananas and grapes are also good. Some people use soaked dog or cat food and tinned pet foods, but these may attract rats, crows and cats. Avoid using peanuts, fat and bread in summer, since these can be harmful if adult birds feed them to their nestlings. 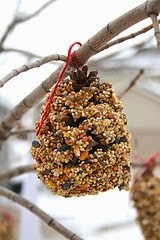 Fill a pine cone with peanut butter and then roll it in some bird seed. Tie your pine cone to a tree with a piece of string or wire and soon you will have dozens of new feathered friends flocking into your garden for this lovely snack. 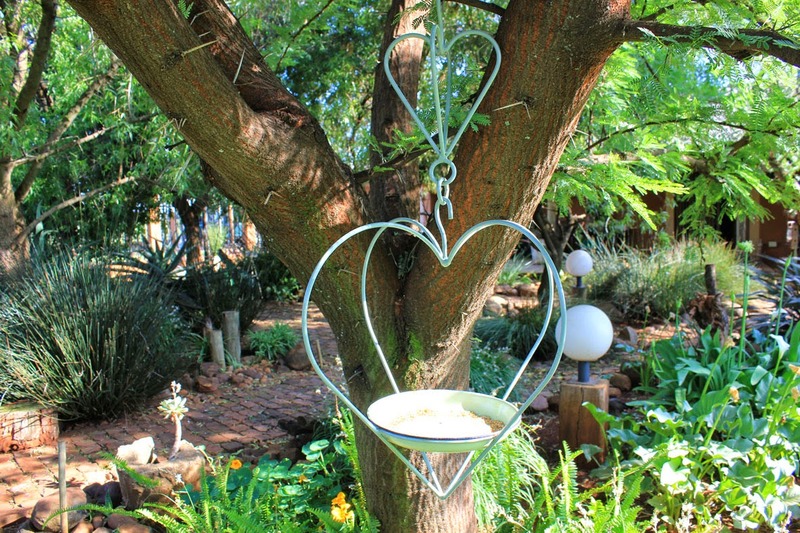 A quick, easy and inexpensive way to cater for the fruit eaters is to bend a wire coat hanger into a heart-shape. Add another piece of soft, pliable wire to the top of the hanger onto which to attach the apple, hang in a tree and voila! bob's your uncle! 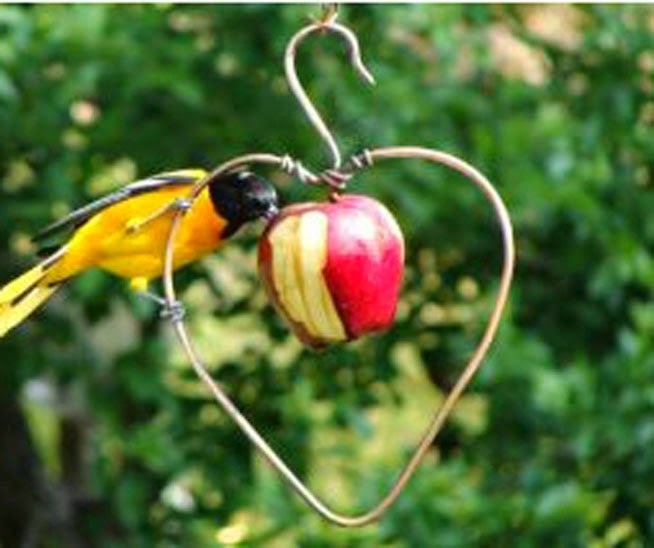 The Black-headed Orioles regularly visit to enjoy the fruit I put out. This is the scene that greets me most mornings when I go out to fill the feeders and feeding tables. This crowd is a mix of Buntings, Larks, Canaries, Weavers, Laughing Doves and possibly a few Queleas as well. As soon as I turn my back after filling all the various feeders, everybody swarms down to see what is on offer! Birds require high energy (high fat) foods during the cold winter weather to maintain their fat reserves to survive the frosty nights. Use only good quality food and scraps. 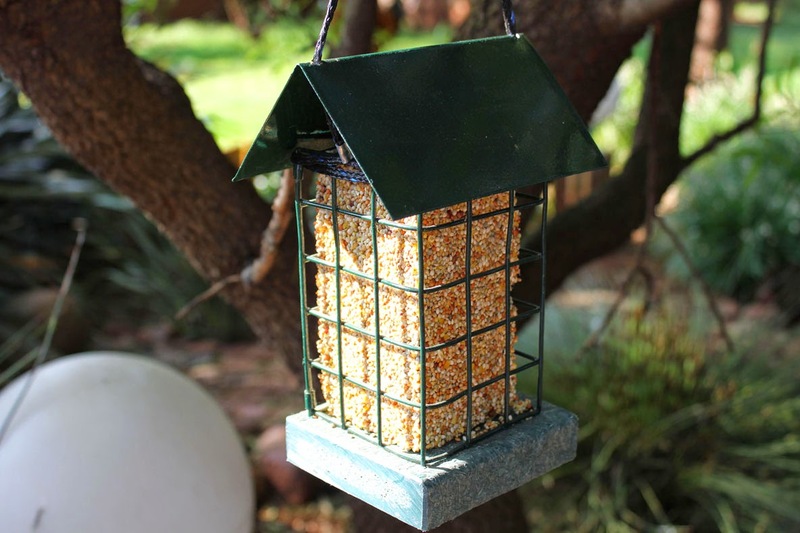 A suet feeder, like the one above, provides them with a good source of fat and protein. 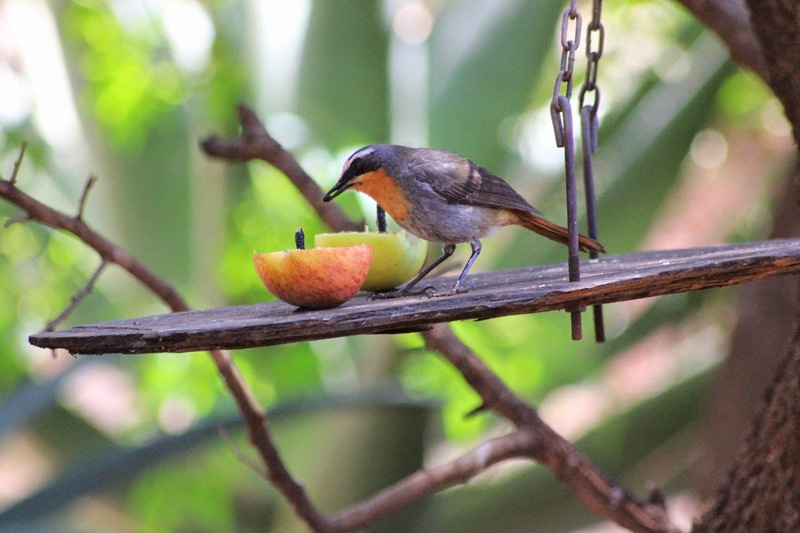 A Cape Robin enjoying some of the fruit on offer. 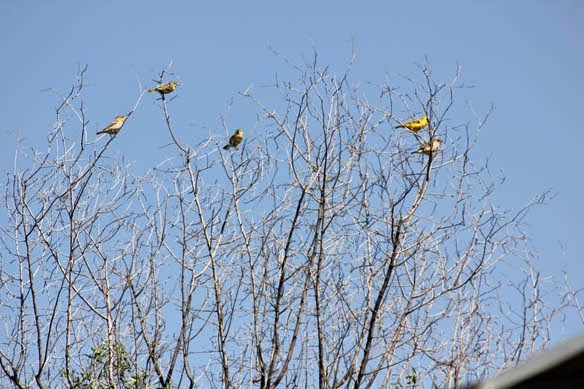 Experts disagree about whether backyard bird feeding will significantly help bird populations. 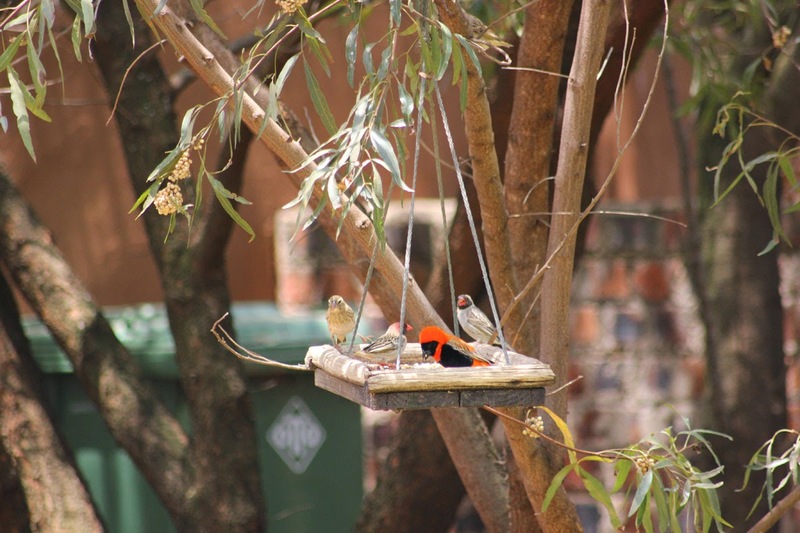 But feeding certainly can help individual birds in your neighbourhood. And don't worry if you must stop feeding briefly—while going on holiday, for example. 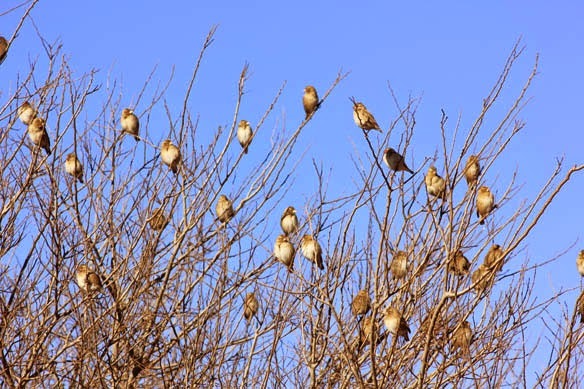 In all but the most severe weather conditions, wild birds will find other food in your absence, particularly in suburban areas where other birdfeeders are just a short flight away. 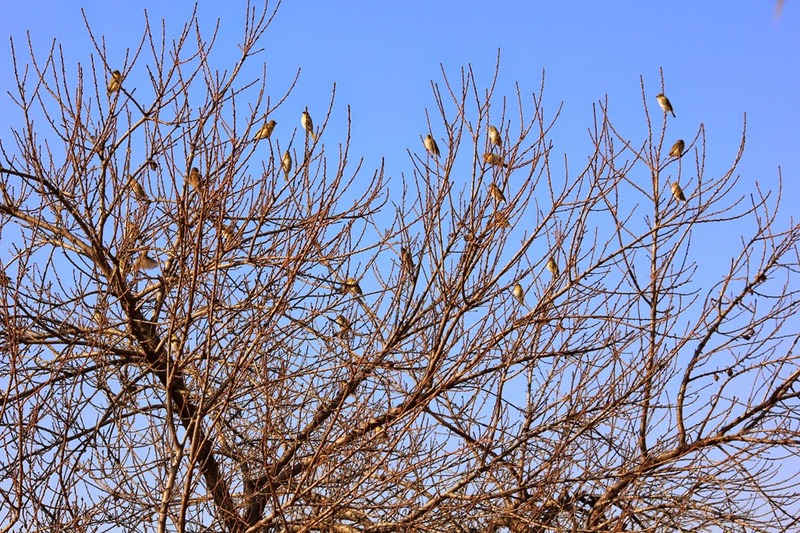 If you live in a rural or isolated area, however, try to arrange to have a neighbor maintain the feeders during winter absences. 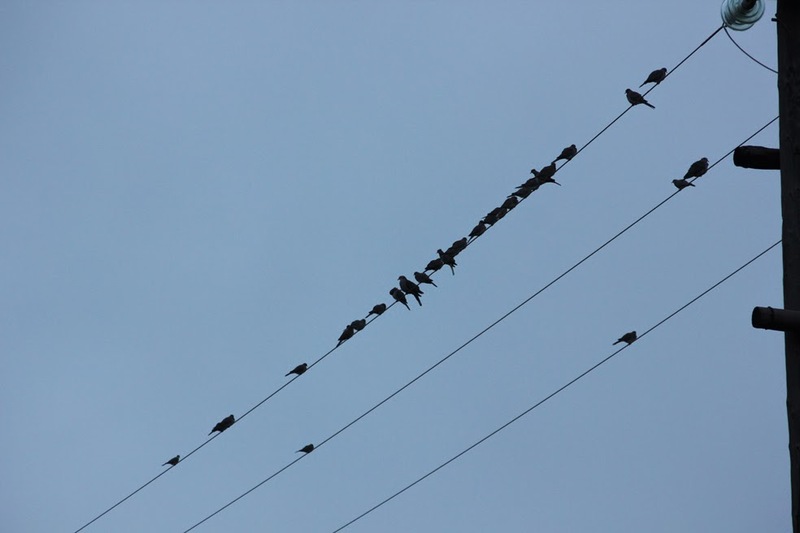 Seeing the doves sitting on the wires, reminds me of my mother, and brings a smile to my face, On week-ends when I would visit, I would watch as they started to gather, get distracted and then look up and there were at least two hundred, waiting patiently for their daily food, It was sad when she passed, as her children we forgot to feed them in our grief, I always wondered where they went to after that. Such lovely memories you have Anonymous! Feeding birds is actually such a tremendous responsibility, when going on holiday you need to ask someone to take over the duty and in the case of someone passing, or if one moves, it's always sad to think where they will go. But they are actually very resilient and will soon find an alternative. Thank you for your lovely chat!